The improvements are numerous and obvious right from the get go. Better facial animation gives added weight to the already excellent vocal performances. A longer draw distance pulls you deeper into an open-world that was already obnoxious in its level of detail, but now feels even more exciting and alive. In fact it’s so beautiful that simply existing in the sun-bleached sprawl of Los Santos and surrounding countryside is as enjoyable as tearing through it on a lunatic murder spree. One of my favourite moments came when I flicked the radio off and drove slowly over a patch of lakeside dirt, listening to the crunch of gravel under my tyres while watching the afternoon sun peel across the water. Bliss. Most impressive of all is the new first person mode. Rockstar could have simply crammed an extra camera in, slapped a bullet point on the back of the box and had done with it. Instead what they’ve done is essentially built an entirely new game. It’s a switch in perspective both literal and psychological. 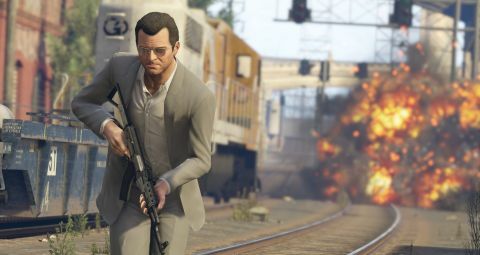 Playing GTA 5 while looking through the eyes of your character connects you to the action in a way the traditional third person viewpoint never could. You’re doing rather than observing. Punch an innocent bystander in the chops for a laugh? Suddenly it’s not as funny as your first whips out in front of you and cracks them in the cheek, sending them reeling. Stamping on enemies while they’re down feels intimately gruesome (I still did it). It’s a genius way of reframing a series notorious for its slapstick attitude towards violence. I found myself being, well, nicer. I drove more sensibly, called taxis rather than hijacked cars and resisted the urge to whip out the sticky bombs every five seconds to make mincemeat out of the cops. To cap it all off, you’ll notice incidental detail put there specifically for first person. The interior of every vehicle has been painstakingly modelled. No two speedometers are the same, the upholstery is different, every car, bike, plane, boat and blimp has its own unique space. It all feels incredibly immersive, which, combined with the enhanced beauty of the open world, makes you feel like you’re living inside GTA 5 instead of simply playing it. The combat engine has never been a GTA strong-point, but the addition of first-person turns shootouts into a thoroughly decent FPS. It’s no Battlefield, but being able to ironsight for accurate shots to the head liberates combat from the twitchy, heavy, cover-based affair it was before. There’s tactical bite to the gunplay now, and pulling out a shotgun for close range blasting feels satisfyingly brutal. Better still you can shoot out car windows for brilliantly accurate drive-by shootings. This completely changes how you’ll play against the cops - luring them close enough to take a pot shot at the driver before speeding away to safety. Same too for helicopters. Whip out an AK, take down the pilot, and watch it spin to its doom. Amazing. Most crucial of all, first person mode feels natural - as much a part of GTA as the oddball cast or ridiculous side missions. You could legitimately play the entire game using the new format, although I personally preferred a switch to third person for the cover-based combat. Snap to a wall in first person and your screen fills with grey plaster, which is maybe why Rockstar added customisation options that automatically revert the camera to the traditional viewpoint for more hectic bouts of combat. What else is new? Well there’s more traffic for one thing. Don’t balk. What sounds initially like gushing PR spiel instead amplifies the illusion that Los Santos is a real place. Climb into Vinewood hills and look at it from above (especially at night) and you’ll see car headlamps winding through the streets, the city leaking pearly light into a deep night sky and pulsing like some sort of giant, glistening creature. Throw in the fact each of GTA V’s three protagonists come with a photo snapping smartphone and it’s easy to lose hours simply gawping at the game through a filtered lens. Add ‘landscape photographer’ to the list of fantasies GTA lets you play out. All of which would mean absolutely nothing were it not for a story that’s at once mad, varied and at times breathlessly exciting. Missions feel as fresh and funny as they did a year ago, and revisiting them is rarely anything but a pleasure. Two hours in and you’ve already chased a yacht down a freeway, assassinated a high-profile media CEO and piloted an aeroplane across some stunning scenery. But the heists are the standout - punctuating the campaign with spikes of intense action. Their thrill is heightened by the anticipation - a few missions of planning ramp up the tension so that when you eventually pull one off, it’s like releasing a taut spring of excitement. The characters themselves are less like real people than eccentric vehicles for GTA’s trademark biting satire, but are tightly written. Franklin is the least offensive - a decent guy on the traditional rags to riches rise. Michael already has the riches, but his middle-aged soul is rotting in an uptown mansion surrounded by family who despise him. And Trevor is an unhinged sociopath (take a look at him in first person to see what he has written on his knuckles). Changing instantly between the three is a mechanic I'm still not tired of, especially when it comes to the often hilarious scenarios you’ll find yourself in when you make the switch. Trevor wakes up in a skip, or is bombing through the countryside with a 4-star wanted level. Franklin is arguing with his aunt. Michael is spilling his mid-life crisis at the feet of his psychiatrist. All of it adds to the illusion that GTA 5 carries on whether you’re playing it or not. And finally there’s GTA Online, a game so dauntingly huge you’ll barely scratch the surface after hours of play - and now it’s even bigger. The headline improvement is that now you can have 30 players running around in free-roam mode, swooping round in jets, initiating impromptu street races, or, you know, playing a round of golf (no one ever plays golf). The whole city turns into a giant playground, as if Rockstar has turned off all the rules to satisfy the rampage lust of its players. ‘Go on then,’ it’s saying. ‘We know what you really want to do is prat about in fighter jets and ride motorbikes off the side of skyscrapers. Knock yourself out.’ Plus creating your own character and hauling them through the levels scratches that RPG itch real good. Ahh, experience points. Money. Grinding? No. Grinding here means playing capture the flag with aeroplanes.